Sylhet, BangladeshThere are two main varieties of tea plant: the small-leafed China plant and the large-leafed Assam variety, discovered on the Burma-India border in 1824. There is also a Cambodian variety used mostly in hybrids. Tea grows best in misty, rainy regions at altitudes of 2,000 to 7,000 feet in the tropics and lower elevations in temperate regions.. The best tea is produced in regions that have dry days and cool nights. Slow growth under some stress brings out the best flavor in tea but yields are lower under these conditions. Tea requires year round maintenance. Every one to five years the plants are trimmed from waist to knee height to keep them from growing into trees and prevent the branches from extending too far sideways. Seasonal pickings keep the bushes trimmed like a hedge. 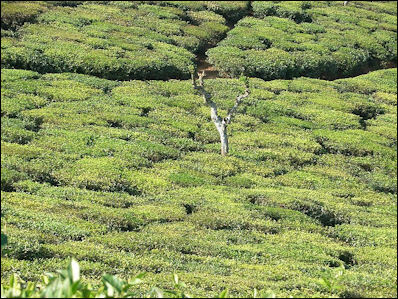 The waist-high bushes at a typical tea plantation are often 25 to 90 years old. Tea growers are now experimented with new strains such TV29 that produce as many more quality leaves than present bushes. Tea plantation in India Much of the world's tea is harvested on plantations called "estates" or "gardens." Many of these have ski-tow-like ropeways and chutes that are used to carry leaves to where the leaves are processed. The tea industry is a labor-intensive business driven by thousands of peasants who pluck and dry the leaves are paid very little---often less than $1 a day---but usually live in free housing in crude dormitories on the estate where they work, and they are given free medical care and education. . Tea bushes are grown from cuttings or seeds. They take about four years to mature. When they are six to 18 months old they are planted in a the plantation and when they get a little bigger they replanted into their permanent spot in a row at the plantation about four feet apart. About 3,000 plants grow in hectare of land. 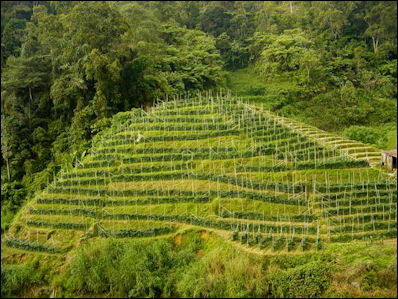 Tea grows best on sloping terrain. Tea plants on mountains and hills rest on carefully constructed terraces that trap water and prevent erosion. Sometimes trees are planted for shade and windbreaks. Plants grow in low regions are ready to harvest after three years. Plants grow in high regions are ready to harvest after five years. The tea pickers pluck new and tender "flush" (two leaves and a bud). These flushes appear every seven or eight days in hot climates and around twice that long in cooler climates. Generally the buds near the end of a branch are considered to be the best quality. Lower quality one are found further down the branch. The flushes are flung over the shoulder of the pickers into baskets strapped onto their heads and backs. Good pickers pick around 160 pounds of leaves a day, form which about 40 pounds of finished eta is made. Freshly picked leaves weigh about twice as much as correctly dried tea leaves. Skill and experience are needed to accurately judge their condition. It is difficult to produce a high quality tea. Some that do pick just one bud and two leaves from a single twig (many companies remove more leaves to increase production) and pick the leaves between 9:00am and 3:00pm when the leaves are in the best condition. Tea drying Most tea is processed in large multistory buildings that often look like giant wooden sheds. The tea is often brought in by trucks, moved through the factory on conveyor belts and elevators. A factory may process 20,000 kilograms of leaves a day in the high season. This yields 5,000 kilograms of tea. The final product is placed in large bags that are moved by truck, train or ship. Green tea is put in a "steamer" and heated immediately after it is picked. This softens the tea for rolling. The tea is not fermented. The leaves are rolled and dried. Leaves that are made into black tea are “withered” (de-moisturized by blowing air through them) in a withering shed or upper story of the factory. Here, piles of leaves are set on hessian mat, nylon "tats," and withered by duct-blown hot air created by large machines with large fans and heaters. Withering removes moisture while leaving the leaves soft and pliable. tea sorting Next the tea is rolled in special machinery rather than crushed so that they aromatic oils that flavor tea are not destroyed. While being rolled the juice oozes for tea leaves and fermentation begins. After rolling the tea is fermented more by placing in a cool, moist room to accelerate oxidation, in the process turning the tea from green to bright copper. The length of their fermentation process determines how much oxidation takes place, which in turn determines whether the tea is green, black or oolong or another variety. During the next stage the tea is dried or “fired” for 15 to 25 minutes. For black teas, the copper leaf turns black as carefully controlled driers reduce water content to 3 percent. The key---and the tricky part---to producing good tea is stopping fermentation and cutting off oxidation at precisely the right time. Finally, the “made tea” is sorted and rated into commercial grades, ready for shipment. The grades are determined both by size and quality and the elevation they are grown. 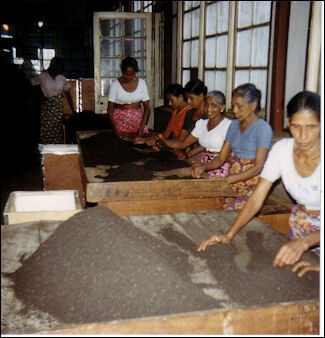 Different sizes are sorted using machines with trays that shake the tea. tea tasters The cups are usually lined up in a row. The tea tasters don't drink the samples but taste and test them by making loud slurping noises as they slosh them around in their mouth, finally spitting the samples into enamel spittoons that they roll along with them. To fully enjoy the flavor of a brew, tea tasters recommend that you slurp it. Malaysia tea plantation Based on decisions form the tea tasters, teas are blended in different varieties and generally sold in bags or loose leaves Tea quality and taste are influenced by blending, cultivation techniques, soil quality, altitude, rain, sun, plucking, weather during the growing season and care taken during processing and shipping, among other things. According to one expert Americans prefer "pointy," light flavored high altitude teas while English like "thick" teas. Tea is usually at auctions in the country of origin or at commodity markets in Europe or the United States and simple sold in deals made between producers and buyers. In the old days tea was sold in chests and buyers drilled holes in the chests to sample the quality. 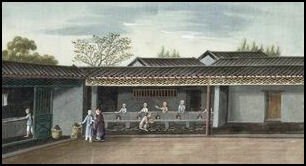 The tea industry has suffered as a result of global competition, fickle consumer tastes and labor disputes. 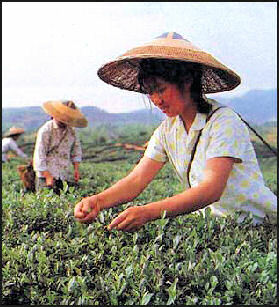 Tea planting In 1998, a glut of tea from low-cost producers caused prices and profits to dive. 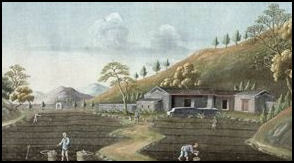 Some estates suffered labor problems or sold their tea at below cost prices. Others went bankrupt or abandoned their operations. Kenya and Sri Lanka are now the world’s largest tea exporters, each sold 314 million kilograms on 2006, ahead of India, which sold 204 million kilograms. 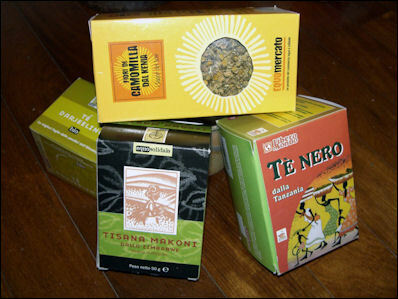 In 2008 Kenya was the leading tea exporter. Tea production costs: 1) India ($1.62); 2) Sri Lanka ($1.16); 3) Kenya and Malawi ($0.84). Costs are higher in India in part because of laws that estates must provide workers with education and medical care and drinking water. In 2010, prices reached a record $3.97 a kilogram in part because a drought in Kenya that was devastating to tea crops there. The system works much better with coffee. Bahra wrote in Times of London, “In the coffee industry, the relationship between the farmer or worker, and the premium is much closer. 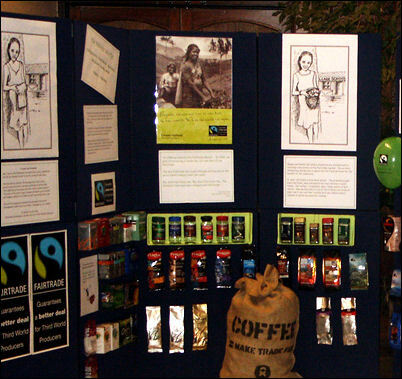 Fair-trade certifies only small-scale farmers (or co-cooperatives) and the Fairtrade premium paid by coffee buyers goes directly to the farmers or cooperative. Fairtrade tea Dunsandle is a tea estate in the Niligiri Hills of south-central India that been received Fairtrade certification since 2000. Workers at the estate that talked to the Times of London were quick to criticize the designation or had never heard of it. One said, “No matter what the propaganda [related to Fair-trade] is in Europe, nothing is being done here to help us.” Another said, “If there is extra money, we have no idea what is happening to it. We requested help to buy gas or a bus to take the children to school. There was talk of a community center being built, but nothing has happened.” One of the problems with Dunsandle is that only a small percentage of the tea sold by the estate is Fairtrade.” The workers earn a basic wage of $1.76 a day. Much of the money from the Fairtrade premiums have gone into a retirement bond scheme that its beneficiaries don’t understand. Kitumbe is a Fair-trade-certified tea estate, owned by the international tea conglomerate Finlay’s, near the Great Rift Valley in Kenya. Workers there live three or four to a room in one room shacks with leaky roofs. The Times of London reported managers at the estate were given ample warning that the FLO inspectors were coming. Before they arrived huts were painted and workers were coached what t say. A report by Kenya Human Rights said that sexual harassment and the mistreatment of workers was common at tea estates owned by Finlay’s. The organization said workers were often hired based on their ethnicity and hosting was ‘deplorable.’ There, workers are paid about 42 cents a day. Tea is more popular than coffee almost everywhere in the world except the United States, where it trails behind soft drinks, beer, milk and coffee in popularity. In contrast to the rest of the world which likes its tea hot, 80 percent of the tea served in the U.S. is cold. U.S. tea sales quadruped between the late 1990s and the late 2000s, reaching the $5 billion mark in 2005 and is expected to rise to $10 billion by 2010.